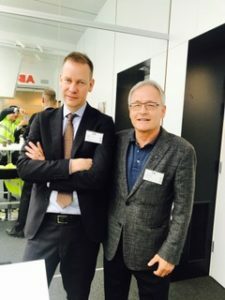 Visit on 20.09.2017 in Stockholm, especially in Västerås Science Park, Expectrum, robot cluster, Robotdalen and ABB headquarters in Västerås, as well as the contacts made during these visits, have spurred SPCleantech to create a new Industry 4.0 collaboration platform. This platform will contribute to promoting the notion of Industry 4.0 among cluster members and supporting them in the process of introducing new technologies. 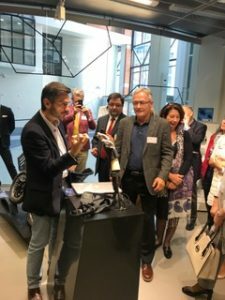 For some time we are entering Industry 4.0, where computers and automation are starting to work in a completely new way, where robots are remotely linked to computer systems equipped with machine learning algorithms that can learn and control robots with very little involvement of human operators. Industry 4.0 introduces the so called “Smart factory,” where cyber-crime systems monitor the physical processes of the factory and make decentralized decisions. Physical systems become the Internet of Things, communicating and interacting with each other and with people in real time over the wireless network. Robotdalen cluster, supports innovators, entrepreneurs, researchers and companies in developing and commercializing their robot innovations. It offers competence in product development, technical analysis, simulation, business development and market development. Partners and networks provide access to, for example, financing, prototype developers, early customers, and incubators. 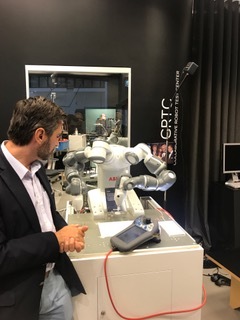 Within the Robotdalen (Valley of the Robots) cooperation takes place between industry, the academic community and public operators in the Södermanland, Västmanland and Örebro districts. This cooperation aims to strengthen the region as a world leader in the manufacturing, research and development of robotics. In Robotdalen we made personal contact with Adam Hagman, a Polish industrial engineer responsible for industrial robots and robots working in the health and hospitality industries. 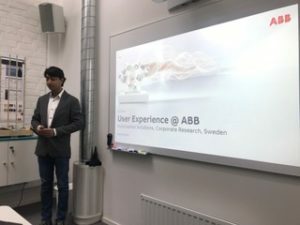 ABB with headquarter in Västerås (S), is a technology pioneer who co-decides on the future of industrial digitization. For over forty years, the group has led innovators introducing digitally integrated and integrated industrial devices and systems. Every year it increases efficiency, safety and productivity in industry, transportation and infrastructure around the world. ABB has been operating for more than 130 years and is present in more than 100 countries and employs approximately 136,000 people. ABB has been investing in electromobility since the turn of the century. Since 2010, the group offers fast charging solutions for electric cars. Worldwide, more than 5,000 networked passenger and delivery systems have been installed. ABB is a leading provider of industrial robots and robotics software, hardware and complete application solutions. The company is present in 53 countries and has installed over 300,000 robots, supported by the widest range of services offered in the industry.